LUKE 12:27 KJV "Consider the lilies how they grow: they toil not, they spin not; and yet I say unto you, that Solomon..."
24Consider the ravens: for they neither sow nor reap; which neither have storehouse nor barn; and God feedeth them: how much more are ye better than the fowls? 25And which of you with taking thought can add to his stature one cubit? 26If ye then be not able to do that thing which is least, why take ye thought for the rest? 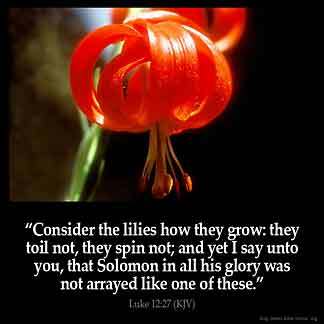 27Consider the lilies how they grow: they toil not, they spin not; and yet I say unto you, that Solomon in all his glory was not arrayed like one of these. 28If then God so clothe the grass, which is to day in the field, and to morrow is cast into the oven; how much more will he clothe you, O ye of little faith? 29And seek not ye what ye shall eat, or what ye shall drink, neither be ye of doubtful mind. 30For all these things do the nations of the world seek after: and your Father knoweth that ye have need of these things. Consider the Lillies how they growe, they toile not; they spinne not: and yet I say vnto you, that Solomon in all his glory, was not arayed like one of these. Consider the lilies, how they grow: they toil not, neither do they spin; yet I say unto you, Even Solomon in all his glory was not arrayed like one of these. Give thought to the flowers: they do no work, they make no thread; and still I say to you, Even Solomon, in all his glory, was not clothed like one of these. Consider the lilies how they grow: they neither toil nor spin; but I say unto you, Not even Solomon in all his glory was clothed as one of these. Consider the lilies how they grow: They toil not, they spin not; and yet I say to you, that Solomon in all his glory was not arrayed like one of these. Observe the lilies, how they grow. They neither labour nor spin. And yet I tell you that not even Solomon in all his splendour was as beautifully dressed as one of these. Consider the lilies, how they grow. They don't toil, neither do they spin; yet I tell you, even Solomon in all his glory was not arrayed like one of these. Biholde ye the lilies of the feeld, hou thei wexen; thei trauelen not, nethir spynnen. And Y seie to you, that nethir Salomon in al his glorie was clothid as oon of these. I work at times so hard to attain and all I have to do is Trust God His Word and Rest in Confidence that he is doing what He said He would do and already has done. Much of the time all I have to do is look into His word and find out what God has already done Take it at face value and believe it and stand on it and receive it. God has already done what He said !!! !